Roland Emmerich may be recognized as a purveyor of disaster thrillers, but he has an equal fascination with history. He directed the 2000 Mel Gibson drama, The Patriot, and then there was the Shakespeare conspiracy film, Anonymous, and last year's gay rights drama, Stonewall. Now he's developing a project that should allow him to explore a key moment in history and show lots of stuff getting blown up. At last night's 20th anniversary celebration of Emmerich's Independence Day, he revealed that a film on the WWII Battle of Midway is on his agenda. 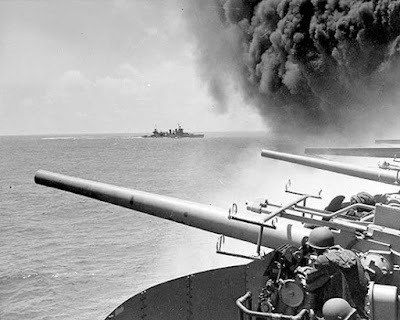 One of the war's most decisive battles, it began on June 4th 1942, only six months after the attack on Pearl Harbor, and saw the U.S. Navy obliterate the Japanese fleet. Legendary director John Ford would soon after produce a propaganda film chronicling the battle, and you can watch the public domain version of it below. Emmerich's perspective on the historical events he's covered has been controversial at best, and it'll be interesting to see if this is a straight-up account of the battle or a complete work of fiction. Emmerich didn't reveal how far along he is on this, and chances are he won't have time to get moving on it at least until Independence Day: Resurgence opens next month.